fig. 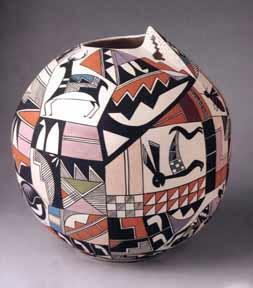 1: Kiva-step vase, 1993.
by Jean Bad Moccasin, polychrome; 10.5"x11.25" dia. Collection of Mr. and Mrs. Wm. Freeman. Photo by Craig Smith. American Indian women have been making pottery for over two thousand years. In this essay, we celebrate the achievements of ten potters who have preserved this important ancestral tradition while advancing the art form through their innovative ideas and masterful craftsmanship. Their approaches to their work symbolize the gradual diversification of Indian culture that has slowly taken place in the United States. Indians work hard to maintain ancient customs. Many of the potters in this book, for instance, carry on the traditions of their ancestors, choosing to excavate the clay, make the pots, and fire them using age-old practices rather than modern methods. This adherence to tradition preserves the Indian way, which, as a culture, remains simple, religious, and often regimented according to the seasons, feast days, or the politics of tribal councils. Yet, today's society has had its effect on Indian culture and probably will continue to do so. Life without cars, electricity, and running water has been threatened by so-called "modern conveniences." While once Indian people tried to keep their children out of the regimented schooling forced on them by the Anglo culture, today integrated education is encouraged, although difficult to achieve. For most Indian communities, the economy has been unstable for many years because of droughts, lack of good farmland, unfortunate social conditions, and truly lamentable governance from Washington, D.C. No longer can most tribal groups be self-sustaining. Still, certain customs in indigenous communities have not changed: Legends, dances, and songs are handed down orally to each generation, and love of the land and of the ancestors is orally taught. The strength of centuries of tradition cements the Indian concept of life, ensuring that the Indian way will continue in some measure, in some places, within the United States. One of the most important traditions in Indian life is pottery making. With thousands of years invested in this craft, the Indian philosophy is built into each pot. It determines the composition, the form, and the decoration. Today's continuation of the pottery tradition ensures that Indian aesthetics are still flourishing. Quite possibly, pottery and other Indian arts help each tribal person mature in today's mixed Anglo and Indian environment. Economically speaking, pottery is an affirmed asset to Indian communities. Although accumulating riches is not an Indian concept, reliance on money from pottery is a contemporary fact. The making and selling of pottery has aided in practical accomplishments - some of which, ironically, like the modern conveniences mentioned earlier, can undermine Indian traditions. But this same public recognition has also enhanced the traditions of Indian artistry. by Nora Naranjo-Morse, 38"x16" dia. The Heard Museum, Phoenix, Az. Photo by Craig Smith. Indian pottery making is an enjoyable but arduous process often involving the entire family; yet it is considered primarily a women's art. For Indian women, claywork provides a living and sometimes fame, although fame is not sought after. If they wanted to, some Indian women potters could compete for artistic prominence anywhere in today's world. The ceramics of American Indian women have evolved through the development of time and traditional techniques into a rich and vital resource for their communities. This is a particularly interesting notion in light of the fact that women still have no vote in most Indian societies. Usually men are in charge of tribal religion. It is men who constitute the tribal council, men who make the laws and determine community and individual behavior. I remember that a few years ago when I was visiting one of the pueblos, a potter told me that she would be leading a women's march the next day on the pueblo plaza. When I asked what for, she said they were protesting a decision that the men of the tribal council had made; she asked me to come. I arrived the next day but there was no march. I was told that the women had second thoughts. It is claywork that provides a way for Indian women to express themselves. Pottery plays a crucial role in tribal rituals and ceremonies; the physical handling of the pots provides emotional and spiritual awareness. It does not go unnoticed by anyone who participates in these customs, even if it is on a subconscious level, that it is women who make these sacred vessels. The work of their hands is always in evidence. Anglo culture has recognized the value of Indian art for several centuries. With the advent of the transcontinental railroad in the 1880s, tourism and access to American Indians and their art increased, bringing fame and fortune to some Indian craftswomen. Traders appeared as intermediaries between the Indian artist and the market. Indians no longer sold pots for pennies by the roadside or in the train station. In the twentieth century, galleries of professional quality have increased the interest in the best Indian pottery as well as other Indian arts. Such galleries exist today in almost all cities in the country, focusing on the arts of their own regional cultures and generally including pottery from the favored vicinity, the American Southwest. 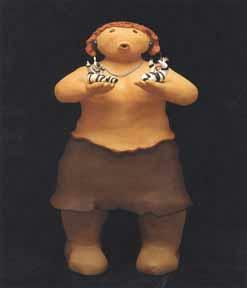 In the pueblo cultures particularly, some Indian artists have established their own selling galleries. Many women sell their pots from card tables outside their homes or on their plaza on feast days. Collectors have discovered that it is possible to visit Indian artists in their homes, finding this an enchanting way to understand the processes and the people. Another important forum is the Santa Fe Indian market, held the third weekend in August every year. It gives a number of prizes, but more importantly affords booths for hundreds of artists and allows several days of communication with the public. Other fairs, markets, and merchandising possibilities are available throughout the country. In addition, museums have elevated the best of native pottery work to the category of fine art. The art of the American Indian is among the great traditions of the world. In fact, its value has been recognized by many important artists in other cultures - including that of Japan, which has its own remarkable clay artistry. Shoji Hamada, the great potter who was named a "Living National Treasure" in Japan, said to me in 1976, "American Indian art is of great significance and represents an extraordinary contribution to the art of the world." I have noted in forty years of experience with Japanese ceramists and American Indian potters many similarities that permeate the living and working ideology of both cultures. Among them are a respect for and an intimate relationship with tradition, strong personal value systems, and reverence for art as part of daily life. But American Indian pottery is a vanishing art. In today's fast-paced society, where technology and mass production are the predominant themes, it is assumed that all folk traditions everywhere will vanish. This is especially true concerning pottery: in the minds of many potters, the sacred clay is too hard to prospect, pulverize, and process and not worth the effort when commercial clays are available. It is only the strong, uninterrupted traditions that will sustain this art. Therefore, it is fortunate for all of us that many Indian women who have chosen clayworking - whether traditional or avant-garde - still want to live the Indian life in their traditional villages. This ensures that the legacy of the matriarchs will continue to support the newer visions of those who follow. It is up to the artists of the new generation to nourish the old, while in the same breath creating the new and individual. The thread that runs through the folk art of all peoples is a significant one. My hope is that Americans will amass collections, create documentation, and organize exhibitions to preserve American Indian pottery. These efforts preserve not only the objects themselves, but the ideas and emotions that arise from the making and studying of these objects - from holding them, touching them. These ideas and emotions fulfill endless human needs - to connect to the raw materials of the earth, to respect and honor ancestral tradition, and to experience the continuity of life and the spirit. We must understand the legacy of what the work stood for and is - an all-encompassing expression of the best that is human.